The new TCX Comp EVO and TCX Comp EVO Michelin are worth a very close look whether you are already a veteran dirt junkie or you are just getting into the sport. If you are unfamiliar with the TCX brand, they are an Italian company and all they do is boots, and in our opinion they do it well. TCX has a history a offering a wider than average foot bed, so if you find Sidi footwear too narrow, these may be your boots. Both the TCX Comp EVO Boots and Comp EVO Michelin sets you up with a boot offering professional levels of protection and the entire boot is CE rated. 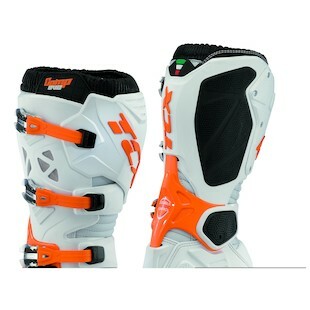 With the major protection highlight being the Double Flex Control Ankle System. This provides top level safety with the added benefit of promoting mobility. This type of system protects against torsion ankle injuries, which are common and can be a season ending event. The boot also offers dirt worthy reinforcements and hard TPU protection in the heel, toe, and shin. In addition, these boots are constructed with a water-resistant micro-fiber material that will help to shed water and keep your feet dry. The two new boots differ only in their sole construction and color options. The Comp EVO sports a traditional stitched sole and a steel toe cap, this is a more traditional style of construction that used both for trail riding and motocross. 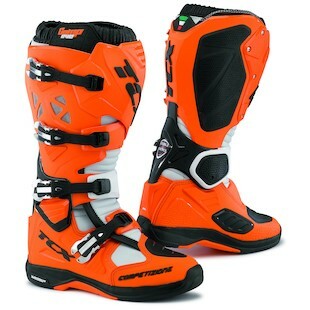 The TCX Comp EVO Michelin Boots up the ante with an aggressive and sticky bonded sole made with Michelin rubber. This upgraded sole will help keep your feet stuck to the bike whether you are racing for the holeshot, soaring through the air, or tackling a gnarly trail. Whether you are a dirt vet or you are new to the sport and in search of your first boot, look no further. The new TCX Comp EVO and TCX Comp EVO Michelin are going to be a major contender for dirt, dual sport, and adventure riders alike.